I was the Flash development lead on this project, developing prototypes, and selecting/managing the freelance Flash development team. 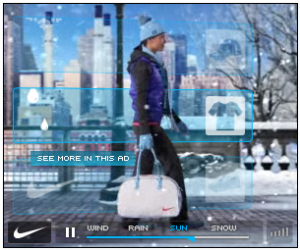 The ad was later featured on the Nike.com homepage, and modified for in-store playback. Selected for 2008 Cannes Cyber Lion short-list. This entry was posted on Monday, December 8th, 2008 at 16:52. It is filed under Agency.com, Portfolio, Showcase, Work and tagged with Agency.com, AS3, awards, Cannes, Flash, Nike, rich media, Team Management, video. You can follow any responses to this entry through the RSS 2.0 feed.